Misty's Black Mist was the first known black pinto in Misty's family since Misty's mother The Phantom. She was born in Manheim, Pennsylvania and was Misty II's fourth foal. Black Mist was the first of Misty II's foals to be born off the island. Even when she was a few hours old Black Mist made her public debut with newspapers telling of the new descendant of Misty, the story carried as far as Tokyo. Her sire was a thirty year old black pinto Chincoteague stallion named Rebel, owned by Joanne Kricker of Maryland. Kricker had asked if Kendy Allen was looking for a stallion to breed with Misty II. Misty II was intended to be bred back to Rebel after Black Mist was born but he was too old and died shortly after. Black Mist looks a lot like her sire. Black Mist was gentled to ride by the Allen children when she was two years old. She became a 4-H horse and competed in horse shows. 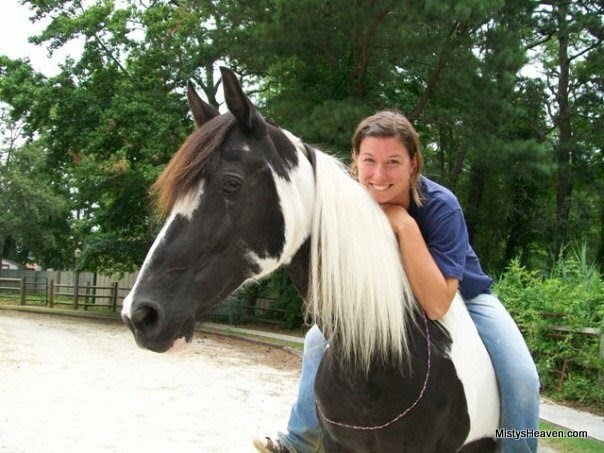 Kirsten Kauffman, a girl who adored Black Mist, soon took the mare on as a special training project and took her to many shows. Kristen and Black Mist won in western pleasure in the 4-H state finals. Katye Allen trained Black Mist for hunter classes, which the mare excelled at as well, becoming quite a diversified mount. Black Mist was a lifelong member of Chincoteague Pony Drill Team, ridden by the team captain. She was so well trained that she can also be ridden without a saddle or bridle and only a piece of string to guide her. Black Mist was arguably the most well trained Misty family pony ever along with being one of the most famous. Black Mist had three foals, all of whom followed in her footsteps by becoming sucessful show horses. Her first foal was born in 1994 and was sired by the Allen's stallion Lightning of Chincoteague. At the time he was the first known bay in the Misty line and for this reason he was named Misty's Chesapeake Bay. Black Mist's second foal Misty's Morning Glory was born in 2001 and shared her mother's black pinto coat. Her third and final foal was born in 2007 and was a black pinto colt named Misty's Irish Mist. Morning Glory and Irish Mist were both sired by Cezanne. 1996 marked the 50th anniversary of Marguerite Henry's book Misty of Chincoteague. To celebrate this occasion, Breyer Animal Creations created a set of models portraying Black Mist along with her mother, Misty II, and half sister Misty's May Day Twister. The trio also attended Breyerfest that year and were greeted and admired by many fans. Black Mist often wore her special Breyer blanket when making public appearances. With the drill team Black Mist performed at Equitana 1998, where they were named youth world champions. She was invited to the University of Louisiana to be part of the University's Annual Horse Event. She was unfazed by having to perform after the US Army's Fifth Cavelry of Texas, whose performance inlucding cannons and gun shooting. Black Mist has been the subject of many forms of media. She has been featured in artwork by Kevin McBride with her daughter Misty's Morning Glory in the 2001 Pony Penning poster and they also a couple of ponies in the painting "Cezanne's Legacy". Black Mist was in a painting with her dam and her half sister Twister by Nancy Hogan Armour titled "Misty Legacy". She was also the subject of a painting by Caitlin McCauley. Black Mist was also the topic of a children's book by Kendy Allen titled Misty's Black Mist and the Christmas Parade, part of a series of books created for the Chincoteague Pony Centre. A chapter on Black Mist written by her rider Kirsten Kauffman was published in Equus Magazine's 2003 book Straight from the Heart II. She was also in Chincoteague Revisited by Jennifer Cording, Chincoteague Ponies by Victor Gentle, Out of the Sea: Today's Chincoteague Pony by Lois Szymanski, and was pictured alongside her daughter and eight other Misty ponies in Horses In Living Color by Barbara Livingston. A Cat's Meow piece with a picture of Black Mist standing on a stool which was only available on Chincoteague. Black Mist was on Chincoteague every summer for Pony Penning since the opening of the Chincoteague Pony Centre in 2000. She was seen performing in the pony shows and giving lessons. Because of her calm and well trained nature she was often chosen for public appearances, greeting the public, and once even for a wedding photoshoot. Black Mist passed away in August of 2011 surrounded by her human and equine family after a battle with cancer.